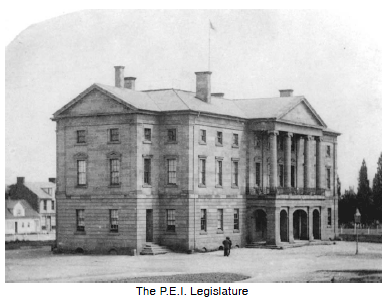 Prince Edward Island joined Confederation basically as a way out of its financial problems. It had first rejected the idea in 1867, even though it had hosted the Charlottetown Conference in 1864 where Confederation was first proposed. The islanders preferred being part of Great Britain although they contemplated other options, like being a distinct dominion of their own or even pursuing annexation: to be joined or added to another state.annexation with the United States. Sir John A. Macdonald, ever wary of the threat to Canada of American expansionism, tried to lure P.E.I. into the union with various incentives, but it wasn't until they were faced with a major financial crisis that the political leaders began to consider Macdonald's offer. An ambitious railway-building plan had put the government into debt and created a banking crisis. The Canadian government agreed to take over the island's debt, give the province an annual subsidy: a grant or contribution of money, especially one made by a government.subsidy to buy back lands owned by absentee landlords, give financial backing to continue railway construction and establish and maintain a year-round steamer service between the island and the mainland. During the election of April 1873, island voters had the option of accepting Confederation or having increased taxes. Not surprisingly, they chose Confederation. P.E.I. officially joined Canada on July 1, 1873. Now the Dominion of Canada stretched almost from sea to sea (with the exception of Newfoundland which didn't join until 1949). When Great Britain handed over the Arctic territories, Canada became, in 1880, the second largest country, geographically, in the world. Today P.E.I. is joined to mainland Canada by the Confederation Bridge. Its most famous fictional inhabitant is Anne of Green Gables, created by Lucy Maud Montgomery in 1908.